The Casentino Valley is not the most famous area in Tuscany; foreign and local tourism have passed it by, the wider public stopping in the better known Chianti, along the Mediterranean coast or near Lucca where many foreigners now own a property. Stretching between Florence and Arezzo, this beautifully secluded, wide, oval-shaped valley is surrounded by gentle hills which gradually ascend to mountains, on one side climbing to reach the impressive Apennines and on the opposite side to the Pratomagno, whose ridge separates Casentino from the Chianti region on the other side. This ring of mountains which has prevented the spread of motorways and major railways, preserving the valley’s natural state. The mountains also inﬂuence the climate. It can be cold in winter, with occasional snow in the valley and regular snow on the mountains, while in summer it is quite hot during the day, cooling off pleasantly at night and refreshing itself for the next day. Casentino is handily located for several centres of Italian art and culture – Florence, Arezzo, Siena and Assisi – and not far from the Romagna sea coast with its recreational facilities and beach resort amusements. 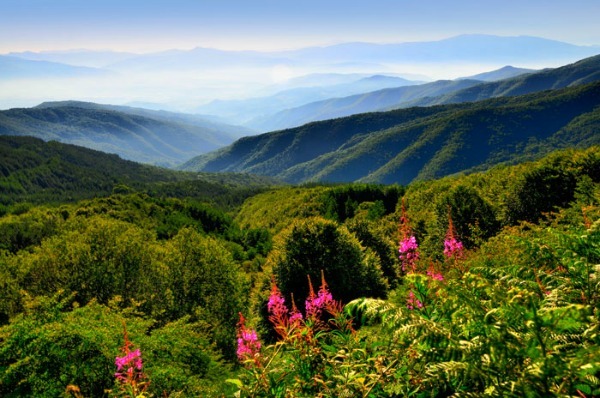 On the Apennine side of the valley is the Casentino Forest National Park, one of the largest and best preserved parks in Italy with 800 kilometres of hiking paths winding through forests of conifers, oak and chestnut, inhabited by many species of animals and birds. All around the Park the valley is dotted with vineyards, olive groves, crystal streams, monasteries, little villages, Romanesque churches and fortiﬁed towns where the visitor can see, taste and experience a little of the rich Italian tradition. The history of Casentino goes back to the Etruscans, who understood the economic importance of the area as a route across the Apennines. After the Roman era came the barbarian invasions which resulted in a period of economic decline. The Middle Ages were the time of the area’s greatest splendour and many large properties were built. For 500 years Casentino was the private domain of a great feudal family, the Conti Guidi. In 1440, after the defeat of the Conti Guidi at the Battle of Anghiari, it was annexed by the Florentine Republic, which administered the region through one of its governors. Due to its geographical position and its history, Casentino has always been a kind of island in the heart of central Italy. The valley has been the backdrop to many historical events and centuries-old disputes between rival communities. The Battle of Campaldino fought in 1289 between the Florentine Guelphs and the Arezzo Ghibellines was splendidly described in Dante Alighieri’s Divine Comedy. The area is rich in well-preserved architectural treasures and monuments dating from the Middle Ages and the Renaissance. Casentino is also blessed with many religious and monastic historical sites. 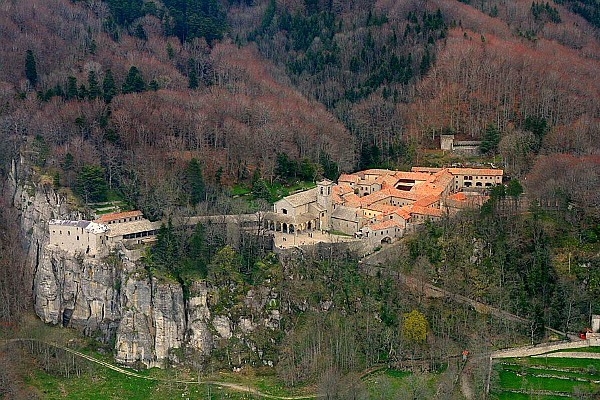 The Franciscan Sanctuary of La Verna for example, where in 1224 St. Francis received the sacred stigmata, was built on a lofty crag, against the background of the ancient forest and around the grotto where he is said to have slept. In the dense forest of the National Park there is the old hermitage of Camaldoli where the monks lived in seclusion and prayer. The tradition of distilling liqueurs from herbs found in the woods was practised by the monks and still sustains their economy. Both monasteries contain many examples Medieval and Renaissance art, including a large collection of Della Robbia terracottas. Poppi is the historic capital of Casentino and is considered one of Italy's most beautiful village. Its famous Guidi Castle is a landmark in the area and its characteristic square tower can be seen from all over the valley. 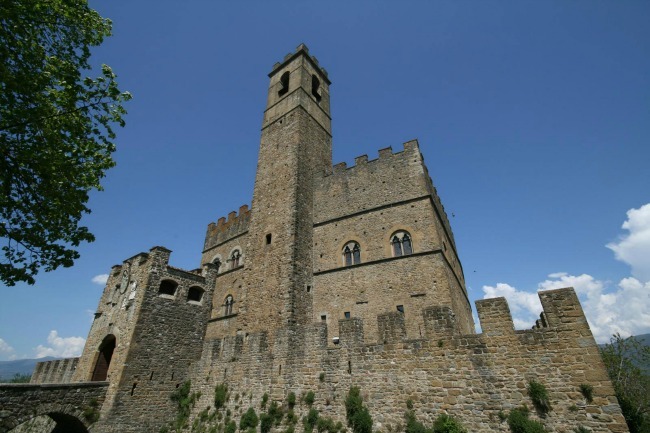 The castle was designed by Arnolfo Di Cambio and is considered a prototype for his plans for the Palazzo Vecchio in Florence. In the evening the castle is ﬂoodlit - a beacon for the traveller. Thanks to continual restoration over the years, especially in the last century, the castle is in excellent condition. In its courtyard, the ‘Rilliana’ Library features hundreds of medieval manuscripts and incunabula (ancient manuscripts written on parchment scrolls). Another feature of the castle is the family chapel with a cycle of 14th-century frescoes ascribed to Taddeo Gaddi, a pupil of Giotto. The Poppi castle is one of a trio. The one in Romena, with its large grassy courtyard and tall towers overlooks the valley from above the town of Stia. The nearby Pieve di Romena church is an extraordinary example of Romanesque architecture. The third castle of the trio is Porciano, visible on clear days even from Poppi. Their interconnection was fundamental to the security of Casentino in ancient times, as each castle guarded a corner of the valley from enemies coming from Florence, Arezzo or from the mountains. Closest airports are Florence and Pisa. By car from Florence airport: follow directions to Pontassieve, then to the Consuma Pass and continue down to Poppi. (About 11/2hours). Otherwise take the A1 motorway south exiting at Arezzo then head towards Bibbiena/Poppi (about 1 and 1/2 hours). By car from Pisa airport: take the Firenze Mare motorway to Florence exit at Firenze Sud and take the road for Pontassieve and Consuma Pass or continue on A1 motorway towards Rome exiting at Arezzo.